When you're trying to wrap your head around freezing the cells of bee embryos for the future, it helps to think of Dippin' Dots. "Dippin' Dots have that really smooth texture to them," says Joe Rinehart, a cryobiologist working to perfect bee embryo freezing. The tasty ice cream treat, he explains, is "actually not frozen. It's vitrified. We're doing basically the same stuff to the embryos." 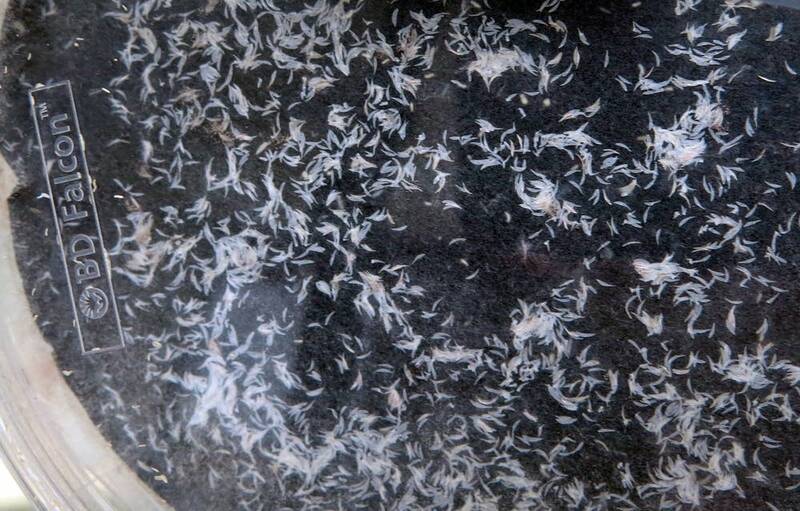 While Rinehart, a researcher at the United States Department of Agriculture labs in Fargo, can easily break the process into bite-sized terms, the science of freezing insect embryos — and bringing them back to life — remains frustratingly complex. With honeybees under stress from pests, disease and pesticides, USDA officials hope to build a bee gene bank to store sperm and embryos, preserving bee genetics for future generations. That's something commonly done for humans and most domesticated animals. But it's a trickier business for bees than for humans. 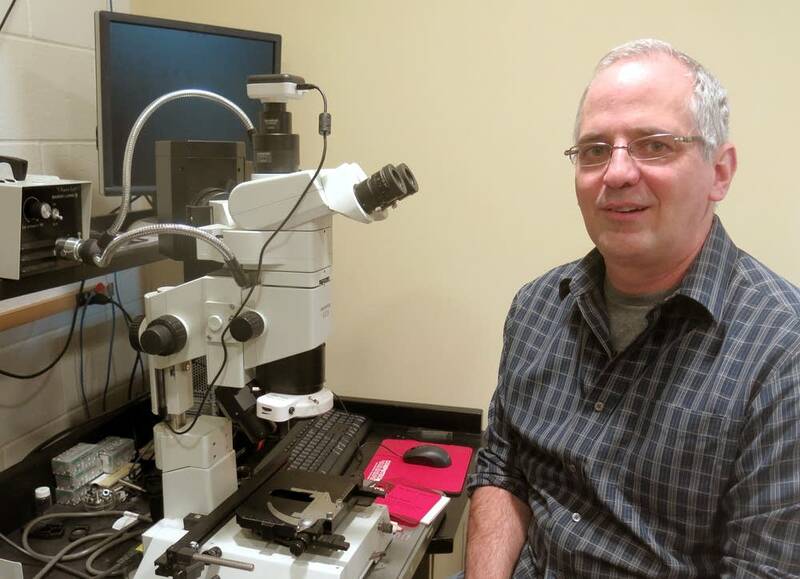 "As near as we can tell the honeybee is the only domesticated species that does not have a sperm bank or a germplasm repository," said Rinehart, one of the handful of experts who've helped make Fargo a key center globally in this kind of insect cryopreservation. 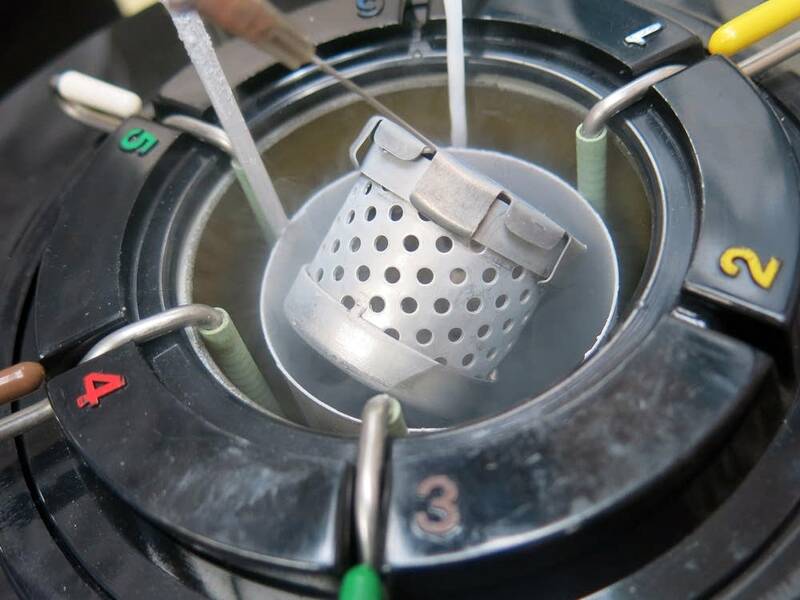 Cryopreservation uses very cold temperatures to stop time for embryos. They remain undeveloped as long as they are stored in liquid nitrogen. 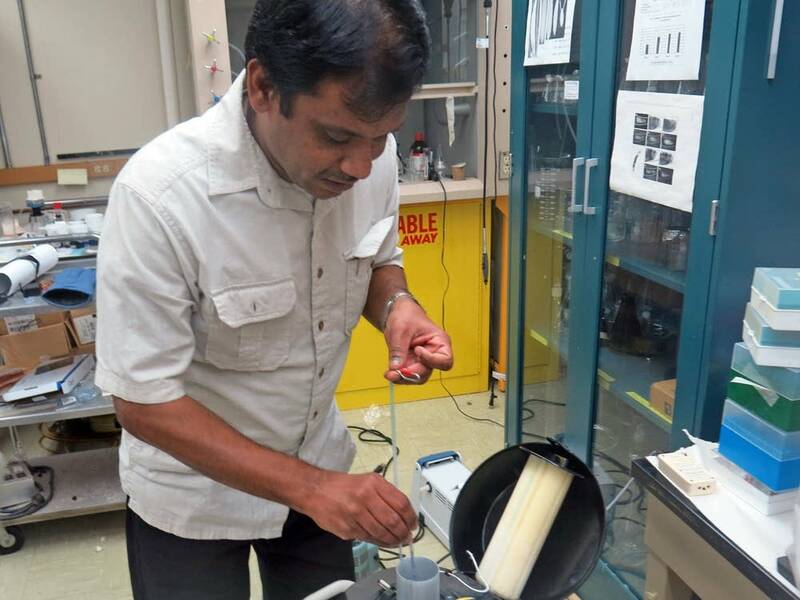 At the Fargo lab, USDA biologist Arun Rajamohan has developed techniques to preserve several species of insects. He's working with very small embryos — about the size of a dash in a text message. He first dips them in common chemicals like bleach and rubbing alcohol to remove the protective shell and waxy covering from the embryo. That allows a chemical to replace most of the water in the embryo, Rinehart said. "Water is bad because water turns to ice, and ice is pointy," he said. "It's like a little buzz saw. If you have ice inside a cell it's just going to rip up that cell." Once most of the water is replaced by a chemical, the embryo is rapidly cooled to a specific temperature, about minus 250 degrees Fahrenheit, Rajamohan said. "When when you flash freeze it — the water molecules — everything stays in one single place," he said. "It just stops and it's glass." That's vitrification, the process that smooths your Dippin' Dots. 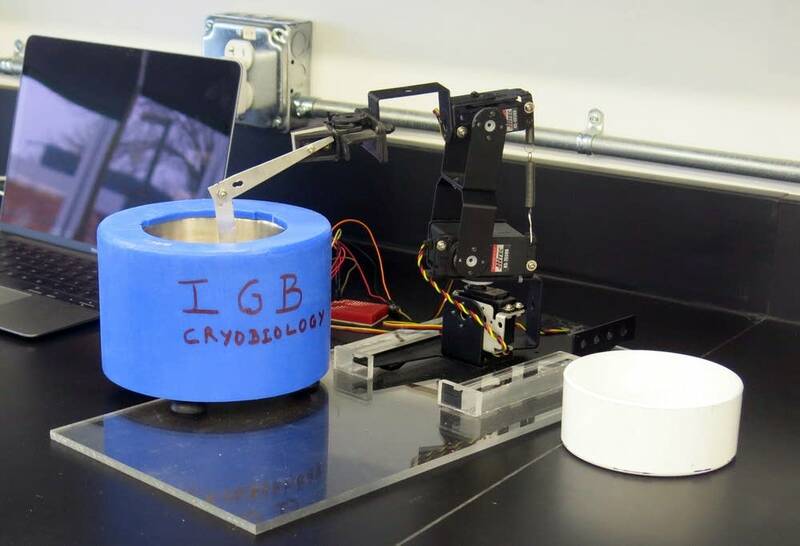 Once the embryos are vitrified they can be stored in liquid nitrogen for a long time at minus 320 degrees at a USDA cryopreservation storage facility in Fort Collins, Colo.
"We say until the end of western civilization. As long as you have a society than can provide liquid nitrogen, they should be fine," Rinehart said. But developing the right process to keep honeybee embryos until the end of western civilization isn't easy compared to the same process for humans. Human eggs and sperm are frozen. Eggs are easier to freeze than embryos. Rajamohan said it will take him at least three years to learn the specific timing of the procedure. He's already discovered bee embryos are a challenge. "Compared to many other insects I've worked with, it's a pretty delicate and tender embryo," he said. Embryos must be preserved at exactly the right time. The right time for bees is a 40-minute window when the embryo is three days old. Each step in the preservation process is so precisely timed that Rajamohan built a robot to remove human error. His techniques and robots are in use in a government lab in Panama and at the International Atomic Energy Agency in Vienna. While the Fargo lab works on a preservation process, a committee of beekeepers, university researchers and government scientists will choose which genetic lines of honeybees are preserved. "We want to make sure we maintain as many useful genetics as we can," said Bob Danka, a researcher at the USDA honeybee breeding genetics and physiology lab in Baton Rouge, La. "The bank at least allows us to go back in and recreate, if not exactly the genetics we have now, something close." Danka is leading the effort to decide what type of bees to preserve first. "We spend a lot of time maintaining bees. They're difficult to maintain," he said. "They're short-lived animals. You can't like a seed put them in a jar on a shelf. So it's a constant struggle just maintenance let alone the research to improve bees." That will change if Rajamohan and Rinehart succeed in Fargo. Rinehart envisions a time when researchers or beekeepers will simply order the genetic line they want from a catalog, a system that will not just help researchers but will create a new industry to provide more genetic options to beekeepers. "The dream is that we will take an embryo out of storage, raise it into a queen bee and then inseminate it with cryopreserved sperm and get a colony," he said. "That's the dream."